measurements at low temperatures can be studied using a stirred equilibrium cell, consisting of a stirred sapphire tubular cell mounted between two Hastelloy C276 or Titanium flanges. 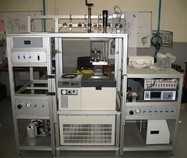 This experimental set-up was designed for working temperatures between 200 to 470 K and pressures up to 20 MPa. In this device, known quantities of substances (liquids, liquefied gases, or gases) can be injected into the cell using Top Industrie very accurate metering pumps (PMHP) and gas tanks.